This article is about the type of galaxy. For the UK radio network, see The Galaxy Network. 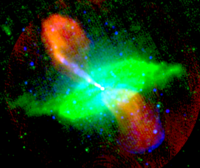 False-colour image of the nearby radio galaxy Centaurus A, showing radio (red), 24-micrometre infrared (green) and 0.5-5 keV X-ray emission (blue). The jet can be seen to emit synchrotron radiation in all three wavebands. The lobes only emit in the radio frequency range, and so appear red. Gas and dust in the galaxy emits thermal radiation in the infrared. Thermal X-ray radiation from hot gas and non-thermal emission from relativistic electrons can be seen in the blue 'shells' around the lobes, particularly to the south (bottom). Radio galaxies and their relatives, radio-loud quasars and blazars, are types of active galaxy nuclei that are very luminous at radio wavelengths, with luminosities up to 1039 W between 10 MHz and 100 GHz. The radio emission is due to the synchrotron process. The observed structure in radio emission is determined by the interaction between twin jets and the external medium, modified by the effects of relativistic beaming. The host galaxies are almost exclusively large elliptical galaxies. Radio-loud active galaxies can be detected at large distances, making them valuable tools for observational cosmology. Recently, much work has been done on the effects of these objects on the intergalactic medium, particularly in galaxy groups and clusters. The radio emission from radio-loud active galaxies is synchrotron emission, as inferred from its very smooth, broad-band nature and strong polarization. This implies that the radio-emitting plasma contains, at least, electrons with relativistic speeds (Lorentz factors of ~104) and magnetic fields. Since the plasma must be neutral, it must also contain either protons or positrons. There is no way of determining the particle content directly from observations of synchrotron radiation. Moreover, there is no way to determine the energy densities in particles and magnetic fields from observation: the same synchrotron emissivity may be a result of a few electrons and a strong field, or a weak field and many electrons, or something in between. It is possible to determine a minimum energy condition which is the minimum energy density that a region with a given emissivity can have, but for many years there was no particular reason to believe that the true energies were anywhere near the minimum energies. A sister process to the synchrotron radiation is the inverse-Compton process, in which the relativistic electrons interact with ambient photons and Thomson scatter them to high energies. Inverse-Compton emission from radio-loud sources turns out to be particularly important in X-rays, and, because it depends only on the density of electrons, a detection of inverse-Compton scattering allows a somewhat model-dependent estimate of the energy densities in the particles and magnetic fields. This has been used to argue that many powerful sources are actually quite near the minimum-energy condition. Synchrotron radiation is not confined to radio wavelengths: if the radio source can accelerate particles to high enough energies, features that are detected in the radio wavelengths may also be seen in the infrared, optical, ultraviolet or even X-ray. In the latter case the responsible electrons must have energies in excess of 1 TeV in typical magnetic field strengths. Again, polarization and continuum spectrum are used to distinguish the synchrotron radiation from other emission processes. Jets and hotspots are the usual sources of high-frequency synchrotron emission. It is hard to distinguish observationally between the synchrotron and inverse-Compton radiation, making them a subject of ongoing research. Processes, collectively known as particle acceleration, produce populations of relativistic and non-thermal particles that give rise to synchrotron and inverse-Compton radiation. Fermi acceleration is one plausible particle acceleration process in radio-loud active galaxies. Pseudo-colour image of the large-scale radio structure of the FRII radio galaxy 3C98. Lobes, jet and hotspot are labelled. Radio galaxies, and to a lesser extent, radio-loud quasars display a wide range of structures in radio maps. The most common large-scale structures are called lobes: these are double, often fairly symmetrical, roughly ellipsoidal structures placed on either side of the active nucleus. A significant minority of low-luminosity sources exhibit structures usually known as plumes which are much more elongated. Some radio galaxies show one or two long narrow features known as jets (the most famous example being the giant galaxy M87 in the Virgo cluster) coming directly from the nucleus and going to the lobes. Since the 1970s, the most widely accepted model has been that the lobes or plumes are powered by beams of high-energy particles and magnetic field coming from close to the active nucleus. The jets are believed to be the visible manifestations of the beams, and often the term jet is used to refer both to the observable feature and to the underlying flow. Pseudo-colour image of the large-scale radio structure of the FRI radio galaxy 3C31. Jets and plumes are labelled. In 1974, radio sources were divided by Fanaroff and Riley into two classes, now known as Fanaroff and Riley Class I (FRI), and Class II (FRII). The distinction was originally made based on the morphology of the large-scale radio emission (the type was determined by the distance between the brightest points in the radio emission): FRI sources were brightest towards the centre, while FRII sources were brightest at the edges. Fanaroff and Riley observed that there was a reasonably sharp divide in luminosity between the two classes: FRIs were low-luminosity, FRIIs were high luminosity. With more detailed radio observations, the morphology turns out to reflect the method of energy transport in the radio source. FRI objects typically have bright jets in the centre, while FRIIs have faint jets but bright hotspots at the ends of the lobes. FRIIs appear to be able to transport energy efficiently to the ends of the lobes, while FRI beams are inefficient in the sense that they radiate a significant amount of their energy away as they travel. In more detail, the FRI/FRII division depends on host-galaxy environment in the sense that the FRI/FRII transition appears at higher luminosities in more massive galaxies. FRI jets are known to be decelerating in the regions in which their radio emission is brightest, and so it seems that the FRI/FRII transition reflects whether a jet/beam can propagate through the host galaxy without being decelerated to sub-relativistic speeds by interaction with the intergalactic medium. From analysis of relativistic beaming effects, the jets of FRII sources are known to remain relativistic (with speeds of at least 0.5c) out to the ends of the lobes. The hotspots that are usually seen in FRII sources are interpreted as being the visible manifestations of shocks formed when the fast, and therefore supersonic, jet (the speed of sound cannot exceed c/√3) abruptly terminates at the end of the source, and their spectral energy distributions are consistent with this picture. Often multiple hotspots are seen, reflecting either continued outflow after the shock or movement of the jet termination point: the overall hotspot region is sometimes called the hotspot complex. Classical double refers to an FRII source with clear hotspots. Wide-angle tail normally refers to a source intermediate between standard FRI and FRII structure, with efficient jets and sometimes hotspots, but with plumes rather than lobes, found at or near the centres of clusters. Narrow-angle tail or Head-tail source describes an FRI that appears to be bent by ram pressure as it moves through a cluster. Fat doubles are sources with diffuse lobes but neither jets nor hotspots. Some such sources may be relics whose energy supply has been permanently or temporarily turned off. The largest radio galaxies have lobes or plumes extending to megaparsec scales (more in the case of giant radio galaxies like 3C236), implying a timescale for growth of the order of tens to hundreds of millions of years. This means that, except in the case of very small, very young sources, we cannot observe radio source dynamics directly, and so must resort to theory and inferences from large numbers of objects. Clearly radio sources must start small and grow larger. In the case of sources with lobes, the dynamics are fairly simple: the jets feed the lobes, the pressure of the lobes increases, and the lobes expand. How fast they expand depends on the density and pressure of the external medium. The highest-pressure phase of the external medium, and thus the most important phase from the point of view of the dynamics, is the X-ray emitting diffuse hot gas. For a long time it was assumed that powerful sources would expand supersonically, pushing a shock through the external medium. However, X-ray observations show that the internal lobe pressures of powerful FRII sources are often close to the external thermal pressures and not much higher than the external pressures, as would be required for supersonic expansion. The only unambiguously supersonically expanding system known consists of the inner lobes of the low-power radio galaxy Centaurus A which are probably a result of a comparatively recent outburst of the active nucleus. These radio sources are almost universally found hosted by elliptical galaxies, though there is one well-documented exception, namely NGC 4151. Some Seyfert galaxies show weak, small radio jets, but they are not radio-luminous enough to be classified as radio-loud. Such information as there is about the host galaxies of radio-loud quasars and blazars suggests that they are also hosted by elliptical galaxies. There are several possible reasons for this very strong preference for ellipticals. One is that ellipticals generally contain the most massive black holes, and so are capable of powering the most luminous active galaxies (see Eddington luminosity). Another is that ellipticals generally inhabit richer environments, providing a large-scale intergalactic medium to confine the radio source. It may also be that the larger amounts of cold gas in spiral galaxies in some way disrupts or stifles a forming jet. To date there is no compelling single explanation for the observations. The different types of radio-loud active galaxies are linked by unified models. The key observation that led to the adoption of unified models for powerful radio galaxies and radio-loud quasars was that all quasars appear to be beamed towards us, showing superluminal motion in the cores and bright jets on the side of the source nearest to us (the Laing-Garrington effect:). If this is the case, there must be a population of objects not beamed towards us, and, since we know the lobes are not affected by beaming, they would appear as radio galaxies, provided that the quasar nucleus is obscured when the source is seen side-on. It is now accepted that at least some powerful radio galaxies have 'hidden' quasars, though it is not clear whether all such radio galaxies would be quasars if viewed from the right angle. In a similar way, low-power radio galaxies are a plausible parent population for BL Lac objects. Radio galaxies and radio-loud quasars have been widely used, particularly in the 80s and 90s, to find distant galaxies: by selecting based on radio spectrum and then observing the host galaxy it was possible to find objects at high redshift at modest cost in telescope time. The problem with this method is that hosts of active galaxies may not be typical of galaxies at their redshift. Similarly, radio galaxies have in the past been used to find distant X-ray emitting clusters, but unbiased selection methods are now preferred. Some work has been done attempting to use radio galaxies as standard rulers to determine cosmological parameters. This method is fraught with difficulty because a radio galaxy's size depends on both its age and its environment. When a model of the radio source is used, though, methods based on radio galaxies can give good agreement with other cosmological observations. Whether or not a radio source is expanding supersonically, it must do work against the external medium in expanding, and so it puts energy into heating and lifting the external plasma. The minimum energy stored in the lobes of a powerful radio source might be 1053 J. The lower limit on the work done on the external medium by such a source is several times this. A good deal of the current interest in radio sources focuses on the effect they must have at the centres of clusters at the present day. Equally interesting is their likely effect on structure formation over cosmological time: it is thought that they may provide a feedback mechanism to slow the formation of the most massive objects. Widely used terminology is awkward now that it is generally accepted that quasars and radio galaxies are the same objects (see above). The acronym DRAGN (for 'Double Radiosource Associated with Galactic Nucleus') has been coined. but has not yet taken off. Extragalactic radio source is common but can lead to confusion, since many other extragalactic objects are detected in radio surveys, notably starburst galaxies. Radio-loud active galaxy is unambiguous, and so is often used in this article. ^ Burbidge, G (1956). "On synchrotron radiation from Messier 87". Astrophysical Journal. 124: 416. Bibcode:1956ApJ...124..416B. doi:10.1086/146237. ^ Croston JH; Hardcastle MJ; Harris DE; Belsole E; et al. (2005). "An X-ray study of magnetic field strengths and particle content in FRII radio sources". Astrophysical Journal. 626 (2): 733–47. arXiv:astro-ph/0503203. Bibcode:2005ApJ...626..733C. doi:10.1086/430170. ^ a b Scheuer, PAG (1974). "Models of extragalactic radio sources with a continuous energy supply from a central object". Monthly Notices of the Royal Astronomical Society. 166 (3): 513–528. Bibcode:1974MNRAS.166..513S. doi:10.1093/mnras/166.3.513. ^ Blandford RD; Rees MJ (1974). "A 'twin-exhaust' model for double radio sources". Monthly Notices of the Royal Astronomical Society. 169 (3): 395–415. Bibcode:1974MNRAS.169..395B. doi:10.1093/mnras/169.3.395. ^ a b Fanaroff, Bernard L.; Riley Julia M. (May 1974). "The morphology of extragalactic radio sources of high and low luminosity". Monthly Notices of the Royal Astronomical Society. 167: 31P–36P. Bibcode:1974MNRAS.167P..31F. doi:10.1093/mnras/167.1.31p. ^ Owen FN; Ledlow MJ (1994). "The FRI/II Break and the Bivariate Luminosity Function in Abell Clusters of Galaxies". In G.V. Bicknell; M.A. Dopita; P.J. Quinn (eds.). The First Stromlo Symposium: The Physics of Active Galaxies. ASP Conference Series. 54. Astronomical Society of the Pacific Conference Series. p. 319. ISBN 978-0-937707-73-9. ^ Laing RA; Bridle AH (2002). "Relativistic models and the jet velocity field in the radio galaxy 3C31". Monthly Notices of the Royal Astronomical Society. 336 (1): 328–57. arXiv:astro-ph/0206215. Bibcode:2002MNRAS.336..328L. doi:10.1046/j.1365-8711.2002.05756.x. ^ Meisenheimer K; Röser H-J; Hiltner PR; Yates MG; et al. (1989). "The synchrotron spectra of radio hotspots". Astronomy and Astrophysics. 219: 63–86. Bibcode:1989A&A...219...63M. ^ Hardcastle MJ; Birkinshaw M; Cameron RA; Harris DE; et al. (2003). "Magnetic field strengths in the hotspots and lobes of three powerful FRII radio sources". Astrophysical Journal. 581 (2): 948–973. arXiv:astro-ph/0208204. Bibcode:2002ApJ...581..948H. doi:10.1086/344409. ^ Kraft RP; Vázquez S; Forman WR; Jones C; et al. (2003). "X-ray emission from the hot ISM and SW radio lobe of the nearby radio galaxy Centaurus A". Astrophysical Journal. 592 (1): 129–146. arXiv:astro-ph/0304363. Bibcode:2003ApJ...592..129K. doi:10.1086/375533. ^ Ledlow MJ; Owen FN; Keel WC (1998). "An Unusual Radio Galaxy in Abell 428: A Large, Powerful FR I Source in a Disk-dominated Host". Astrophysical Journal. 495 (1): 227–238. arXiv:astro-ph/9709213. Bibcode:1998ApJ...495..227L. doi:10.1086/305251. ^ Barthel PD (1989). "Is every quasar beamed?". Astrophysical Journal. 336: 606. Bibcode:1989ApJ...336..606B. doi:10.1086/167038. ^ Laing RA (1988). "The sidedness of jets and depolarization in powerful extragalactic radio sources". Nature. 331 (6152): 149–151. Bibcode:1988Natur.331..149L. doi:10.1038/331149a0. ^ Garrington S; Leahy JP; Conway RG; Laing RA (1988). "A systematic asymmetry in the polarization properties of double radio sources". Nature. 331 (6152): 147–149. Bibcode:1988Natur.331..147G. doi:10.1038/331147a0. ^ Daly RA; Djorgovski SG (2003). "A Model-Independent Determination of the Expansion and Acceleration Rates of the Universe as a Function of Redshift and Constraints on Dark Energy". Astrophysical Journal. 597 (1): 9–20. arXiv:astro-ph/0305197. Bibcode:2003ApJ...597....9D. doi:10.1086/378230. ^ "Perseus Cluster: Chandra "Hears" a Supermassive Black Hole in Perseus". Retrieved 2008-08-24. ^ Leahy JP (1993). "DRAGNs". In Röser, H-J; Meisenheimer, K (eds.). Jets in Extragalactic Radio Sources. Springer-Verlag. Atlas of DRAGNs A collection of radio images of the 3CRR catalogue of radio-loud active galaxies.